The Avenon 21mm F2.8 is a precision built, heavy alloy, multi-coated Japanese optic, approaching Leica quality. With its LTM screw-mount (M-mount adapter, not included) it can be accommodated by most modern or classic rangefinder including Leica, Voightlander, Konica Hexar, Epson, and other LTM/M-mount cameras*. It delivers excellent results with little to no distortion. Its hand machined knurling marks on the focusing ring give it a vintage look and robust feel, making it a real gem of a lens to use. This lens boasts a bright aperture of 2.8, extremely rare for a focal length of this width. It has 8 elements in 6 groups, whole f/stops clicks from 2.8 to 22, with markings on lens for ½ stops, 6 aperture blades, 58mm filter size, 7 1/2 oz, 66mm overall diameter x 48mm overall length (35mm mounted on camera). It conveniently needs only 1/4 turn to go from infinity to the closest focusing distance of one meter. The barrel has depth of field scales for 2.8, 4, 5.6, and 8 as well as an IR mark. At F8, DOF extends from infinity to 1 meter! The lens is clean and clear with no fungus, and in perfect working order. It also include the original Avenon branded lens cap as well as aluminum screwmount rear cap, also the original lens hood to prevent lens flare, as well as pouch, boxes, and original documentation . This lens will outperform most examples of the Leica 21mm F4 Super Angulon. Unlike the Leica, the Avenon, with its retrofocus design, meaning that it’s a regular focal length lens with a wide-angle attachment built on the front to decrease the focal length of the combined lenses, is usable with TTL metering on the M5, CL, CLE, and M6. Price wise it’s a excellent alternative to the very expensive, Leica 21mm Aspherical which can cost well over $3000. The Avenon 21mm F2.8 was is production for 8 years from 1994 to early 2002. They were made by a small company from Yokohama, Japan called Y.K. Optical, who also made a slightly less noteworthy Avenon 28mm F3.5. The 21mm lens was sold under several different names. In Japan it was called Avenon, in North America usually Kobalux, and it seems that it was also sold under the name Pasoptik and possibly also under other names. According to my Tokyo lens expert, they were each hand made in low quantities, by one Mr. Abe of Yokohama Japan, the founder of long defunct Komura Camera and Lens, who died some ten years ago, hence the name “Avenon” (B’s and ‘V’s are tricky ones in Japanese). Allegedly the name Kobalux comes from Joseph Stalin whose nickname was ‘Koba’, and who’s name translates to ‘Man of Steel’. Some versions of the lens lack a serial number and my source told me that Mr. Abe died before many of the lens were stamped with a serial number. As this one does have the serial number, it was obvioulsy seen to completion by Mr. Abe. Also noteworthy is that most of the silver versions (there is also a more rare black “Millenium” version) also have silver faces. This lens also includes the native Avenon 21mm viewfinder that is also extremely well built. It is bright and beautiful, with a projected brightlines and parallax correction marks. Also included are both front and rear VF caps to protect the glass in transport. There is minor barrel distortion, but it is still a joy to use. 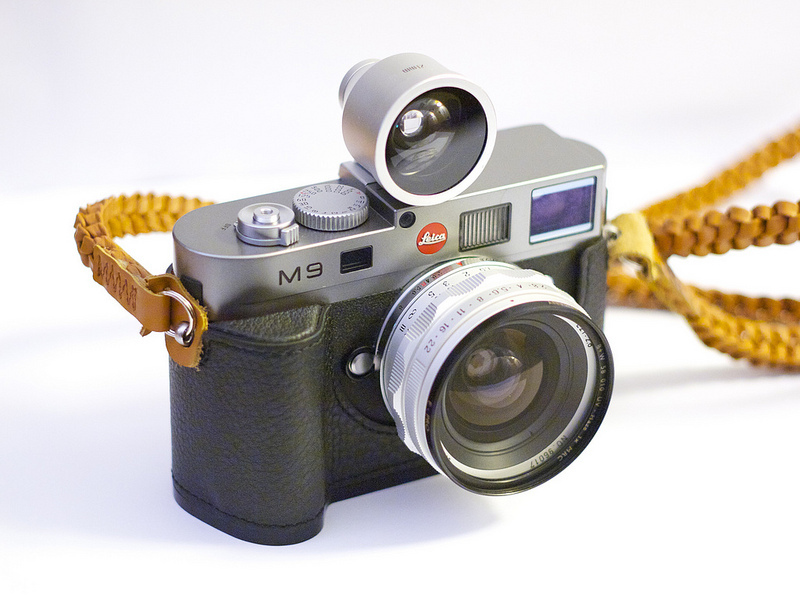 It’s unusually large with a 39mm diameter, which looks quite cool on cameras, as you can see on the Leica M6 example. The whole kit is certain to raise eyebrows wherever it goes. In addition to the Avenon viewfinder, this kit also includes an Avenon branded lens case in perfect shape. The OEM LTM to M-mount adapter (not included, please have one ready if you intend to use this on an m-mount camera) when coupled with m-mount cameras will give you 28 and 90mm framelines in the cameras viewfinder. Also, all the boxes are included with matching serial numbers to the lens, and finally, the original warranty card.